It is with the up most respect that I write this message to Mr. Jim Henry, a true inspiration to all mankind. The day I read the article in People magazine about your hard work to learn how to read and write, I shed many tears out of sheer admiration for you. Your beloved wife would be so proud of your accomplishment and even though I do not know you personally, I can honestly say you have inspired me to follow my dreams and write the book I have been creating in my mind for years. Thank you for leaving such an impressionable mark on the world and for lighting my fire. Of course, I purchased one of your books as well. God bless you Mr. Henry! I read the story in People magazine and was so inspired that I went right online and downloaded the book. I studied English in college and now practice law in the public sector and was so amazed at the strength and courage of this man that I had to read his story. I intened to share it with my son and recommend it to his teachers. James’s story put tears in my eyes. As a freelance writer and editor, I know firsthand how difficult writing can be. When people say, “Your writing just flows so easily,” I want to pinch them! 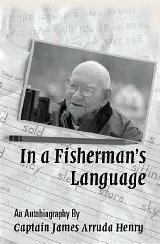 Many people who read In a Fisherman’s Language will probably now become Literacy Volunteers. So, you see, James, how much your story is helping others! There will probably be gazillions of people who will learn how to read because of your giant accomplishment. And isn’t helping others what life is all about? Truly inspiring story. I’m in the process of writing an article for my site on you, Captain Henry. I’ll be sure to email you the link. Keep writing! As a retired gerontological nurse practitioner and recently a writer myself, I was so impressed with Mr. Henry’s story, I had to post it on my blog. Truly inspiring! Rachel Maddow’s “Best New Thing In The World” segment (her final segment of her show each night) was dedicated to you, Captain Henry, and your new book. Mystic, Connecticut. Mmmmm. A couple of years ago a friend and I enjoyed a really, really fun road trip from Illinois to the East Coast. On our way down from Rhode Island down to Connecticut, we happed onto Abbott’s Lobster place. I like to think the charm and good local fare of that place has a bit of your spirit in it. It was the opening of Maddow’s story, mentioning Mystic, that caught my attention. But what brought me to your website was so much more. That I am a teacher only makes my appreciation and admiration for your spirit as a continual learner that much greater. Good health to you, Captain Henry, and enjoy the ride with your new book!